Expected Release: March 19, 2019. Date subject to change. As the Soviet Red Army marches westward, the city of Budapest stands in their way. Encircled and severely outnumbered, the German and Hungarian forces attempt to resist the Soviet juggernaut and defend Festung Budapest to the last. 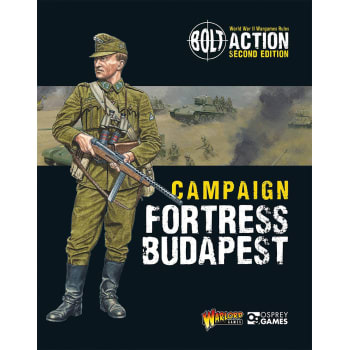 This book brings the siege of Budapest to the table-top with in-depth information on the forces involved, linked scenarios, and new Theatre Selectors that make this an ideal resource for any Bolt Action player with an interest in the the Eastern Front and the fall of the Reich.